This theater was eventually expanded into a fourplex, but when I last attended a show there (1975) it was a single-screen theater. Listed in the 1951 FDY with 600 seats. I was surprised to read that this theatre was demolished, the last time I was actually on the island was during the summer of 2002, and this theatre just reopened for the summer. I know that the Beach Theatre by the Acme just reopened with an added 5th screen and has stadium seating. Is the other theatre, the Colonial 4 still open or is that closed for good too? This is the one down the strip close to Holgate. 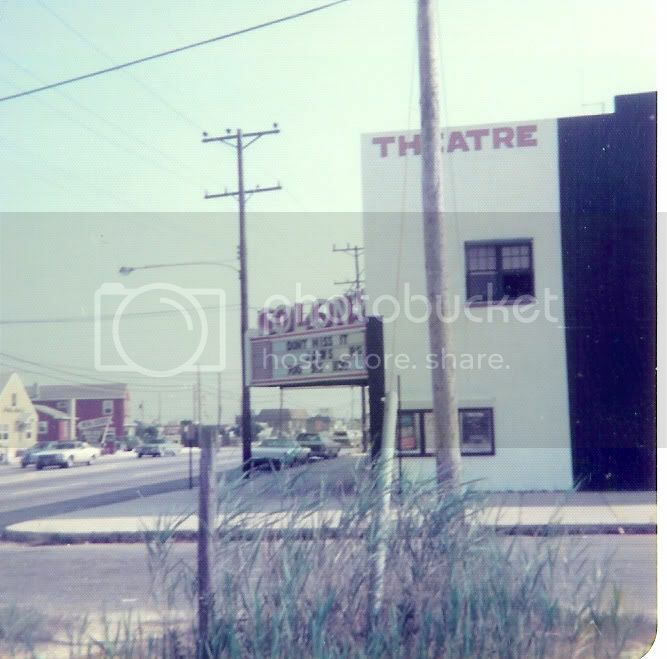 From Arcadia Publishing’s “Long Beach Island”, page 127: This theater was built in the 1920’s by Harry Colmar, who also built the nearby Colonial Theater in Beach Haven. Listed in the 1970 FDY as part of Frank Theatres, Inc. Originally built in the late 1920s by a real estate development company seeking to develop Brant Beach. The real estate market didn’t pick up quickly enough for the investors, who sold the theatre to Harry Colmer. This was the second of three theatres in his chain. Source – Eighteen Miles of History on Long Beach Island by John Bailey Lloyd, pages 160-162.